You can browse through the menu to the right to view some of our past projects or see what we have available for sale or licence right now. We have original paintings, prints and illustrations for sale. For specific info, prices, or to view at full size click on any of the titles to the right. 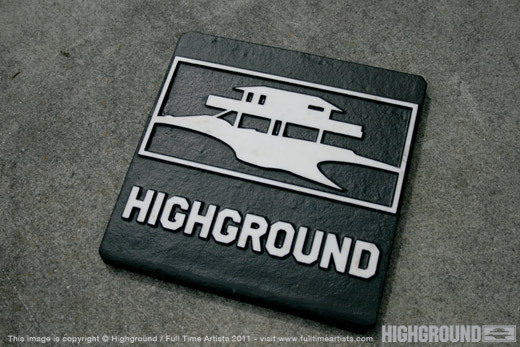 All images shown here were created by Highground Industries. all are copyrighted. These works are shown here as design samples only. ANY unauthorized use is strictly prohibited. 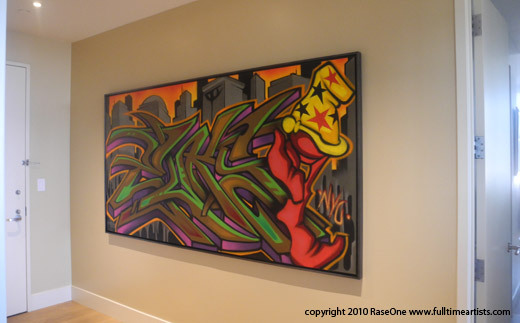 Most of the galleries on this site show only one image of a particular work of art. In this section we feature certain works about which more information & more images are available. 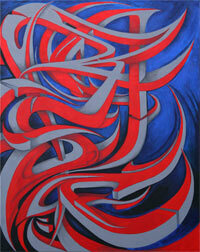 We have worked in a lot of different mediums over the years & found experimentation to be its own reward. This section gives us a chance to display & explain our process & show works in progress<. 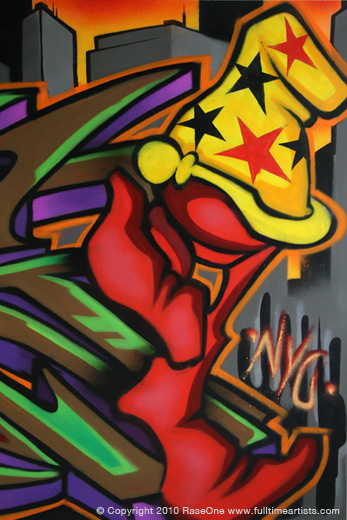 The multimedia artwork featured in this section is all created by our artists & close friends. Elks wanted a piece for his apartment in NY. He was interested in something old school. I've always wanted to bust a Cheech Wizard. 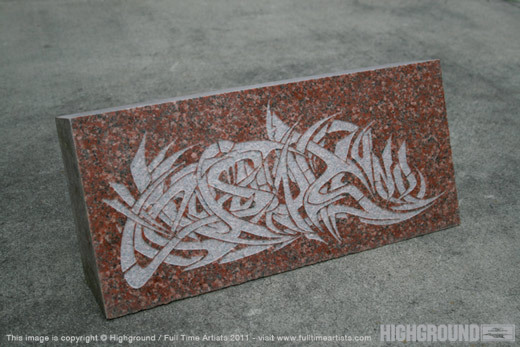 This is one of my smallest wildstyles done with only spray paint. I did several pencil sketches & color treatments letting Elks pick the colors for the final piece. Various sizes. 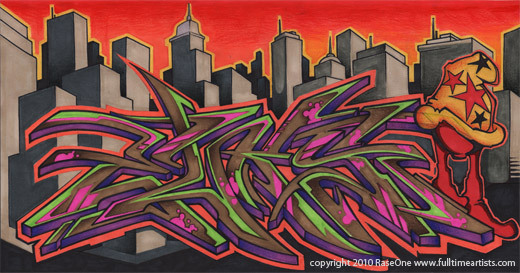 Created by Rase & Kyle Safford - 2003 - 2011. We did the first of these in 2003 & the most recent in 2010. There are about a dozen so far featuring artwork from Rase & Triangulum. I was tasked with creating a large array of realistic graffiti for a video game that takes place in a broken & conquered America. We needed every type of graffiti & we needed to do it with very little memory. By: RaseOne 2004 - This was the cover art for an issue the "English Journal" a magazine for educators. 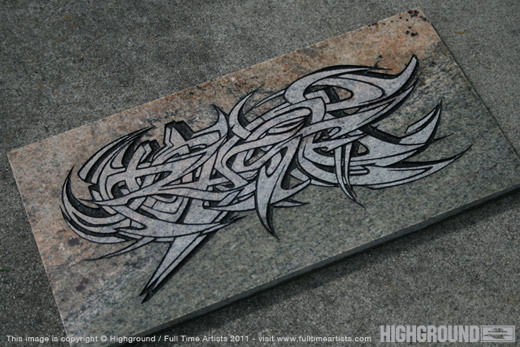 We created several comps using some of our graffiti fonts then this final art by hand. (mixed media) 11 by 17 in. The original is not for sale. This work has been licenced in the past. Reprints are available. This work has been used for an album cover. The original is not for sale. 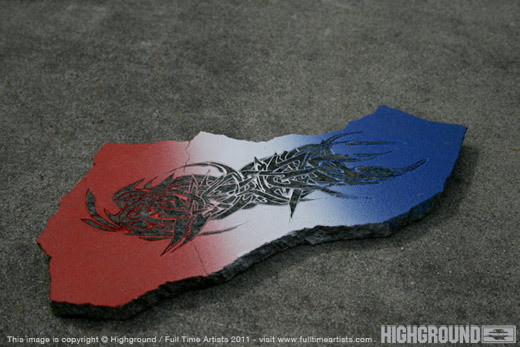 Reprints can be made upon request. 3 by 8 ft. The originals were sold to a night club and are now lost. for info on reprints email us . This original has also been sold. reprints of various sizes are available. Fossil - (mixed media) original & reprints availableThis original is for sale. Reprints in poster frames are available. Sylvia - (mixed media)20 x 12 in. soldThis work was licenced in the past. The original is not for sale. This work was used for an album cover. This work is no longer available. This original is not for sale. Reprints of this work and different variations are in progress. 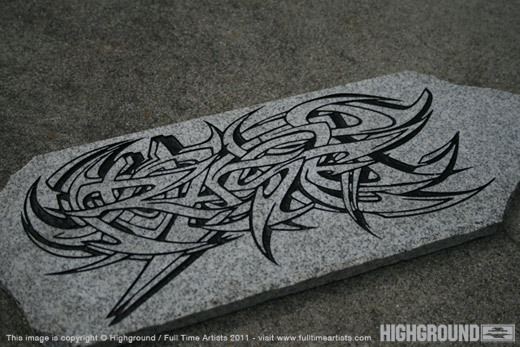 All artwork, images, text, fonts & other content are copyright 1991 - 2011 Full Time Artists / Highground Industries. All rights reserved. Unauthorized duplication is prohibited.